Four works exceeded $100,000 at our sale of African-American Fine Art on Thursday, October 5. A wealth of unique paintings, drawings and monotypes distinguished the sale of approximately 150 lots, nearly all of which were executed in the last century. Lot 4: Henry Ossawa Tanner, Flight into Egypt, oil on canvas, circa 1910. Sold October 5, 2017 for $341,000. 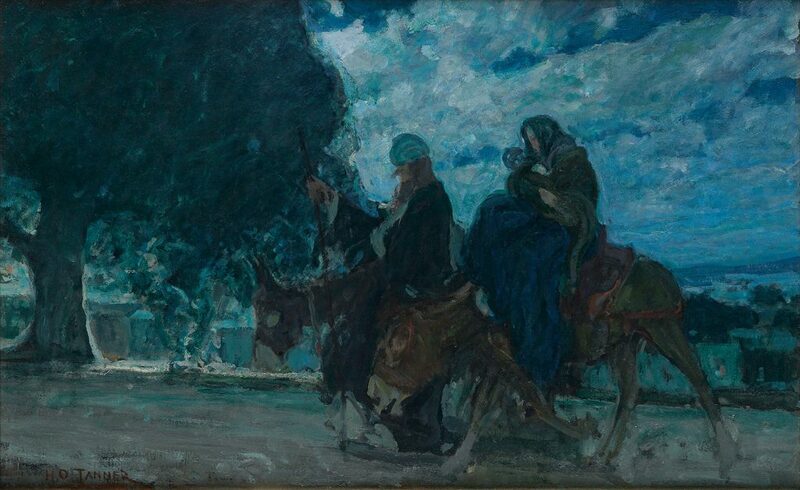 An important nocturne by Henry Ossawa Tanner titled Flight into Egypt, circa 1910, was the highlight of the sale. The subject was a favorite motif of the artist’s, who took several trips to the Holy Land and was deeply inspired by the experience. The large oil painting was purchased by an institution for $341,000. Lot 48: Norman Lewis, Untitled (Procession Composition), oil on marbleized slate, 1960. Sold October 5, 2017 for $233,000. Works by Norman Lewis performed well, selling through the entire run of eight. These were led by an unusual 4.5-foot length of marbleized slate, adorned with small, stylized figures: Untitled (Procession Composition), 1960, sold to a collector for $233,000, above a high estimate of $150,000. Additional highlights by the Abstract Expressionist included a 1960 untitled oil painting on paper, and Sunset, 1951, another oil painting on paper ($21,250 and $15,000, respectively). Of the eight works by Lewis in the sale, only one was a print: the lithograph Untitled (Umbrella), 1945, nearly quadrupled its high estimate to sell for $18,750. Lot 88: Sam Gilliam, Rubiyat, acrylic and flocking on beveled canvas, 1973. Sold October 5, 2017 for $191,000. All but one of the seven offered works by Sam Gilliam found new homes. 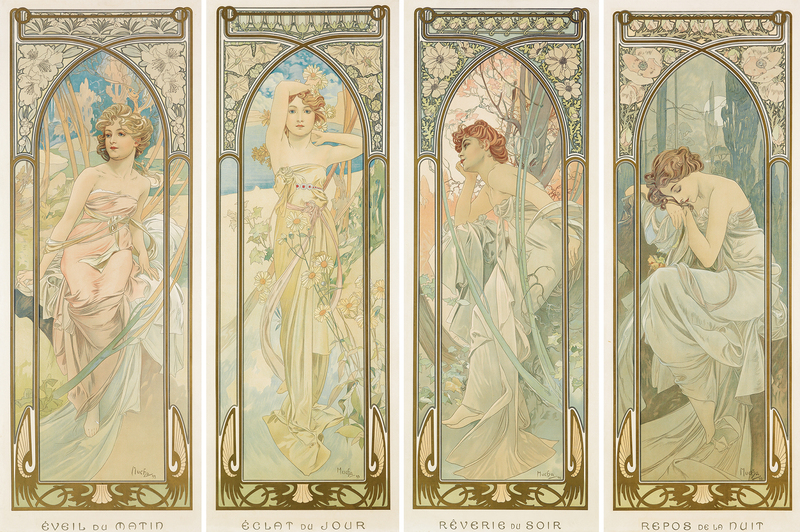 Each represented dramatically different stylistic periods in the artist’s oeuvre. A beveled-edge canvas from 1973 titled Rubiyat more than doubled its high estimate to sell for $191,000. Not Spinning, 2001-04, a plywood collage with acrylic paint, was one of the most contemporary works in the sale: it reached $57,500. Lot 20: Elizabeth Catlett, War Worker, tempera, 1943. Sold October 5, 2017 for $149,000. 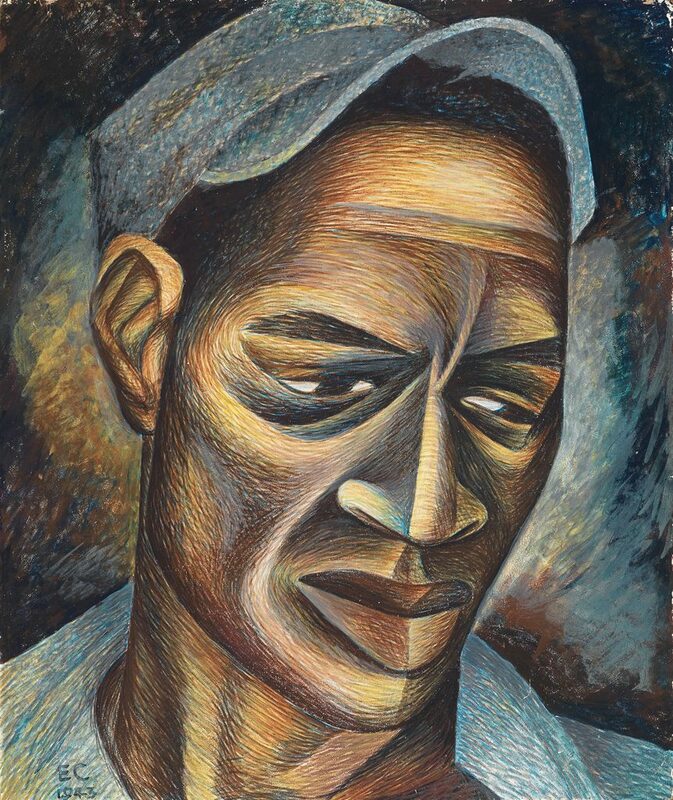 War Worker, 1943, is the second painting by Elizabeth Catlett ever to come to auction. The tempera on paper portrait exemplifies the artist’s work from her New York period. It reached 149,000, above an estimate of $90,000, a record for a painting by the artist. All but one of the eight works by Catlett offered in the auction sold. Two bronze busts, Glory, 1981, and Cabeza Cantando (Singing Head), 1960, found buyers for $40,000 and $27,500, respectively. Lot 39: Richmond Barthè, The Awakening of Africa (Africa Awakening), cast bronze, 1959. Sold October 5, 2017 for $87,500, a record for the artist. A new auction record was established for Richmond Barthè, whose 1959 cast bronze sculpture The Awakening of Africa (Africa Awakening) reached $87,500. 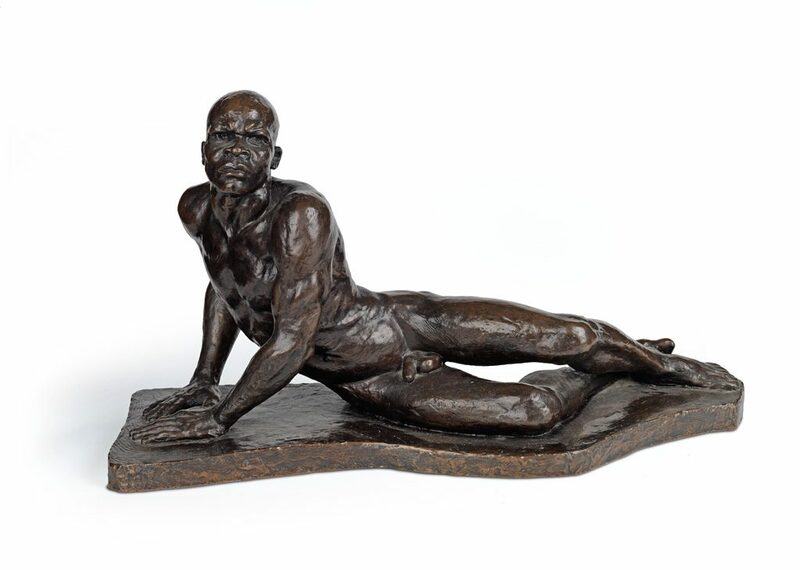 Stevedore, a cast bronze on marble base modeled by the artist in 1937 and cast in 1985, was sold for $75,000. Lot 31: Hughie Lee-Smith, Untitled (Youths on a Lakeshore), oil on board, 1952. Sold October 5, 2017 for $93,750. All three dramatic oil paintings by Hughie Lee-Smith sold for more than $50,000 each. 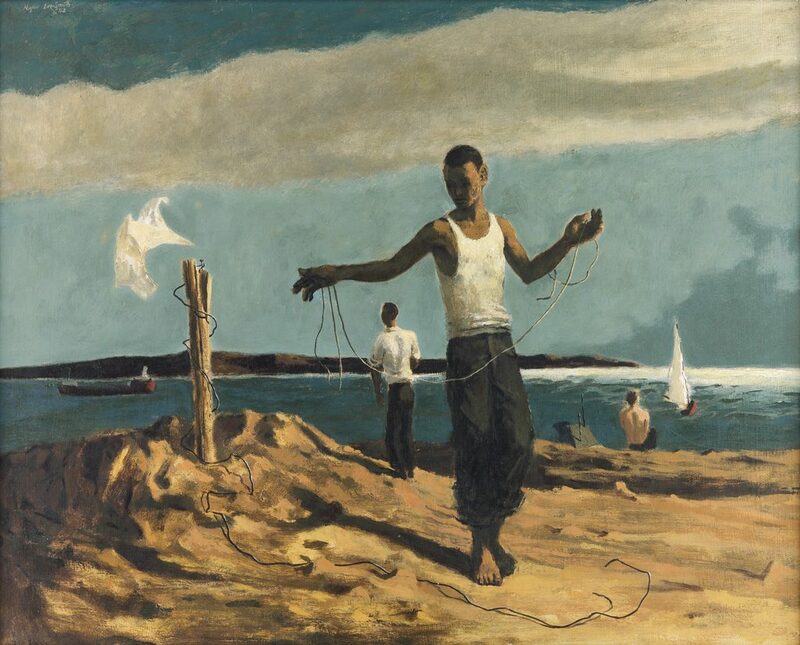 Untitled (Youths on a Lakeshore), 1952, dates to the artist’s time in Detroit, and was purchased by a collector for $93,750. A later cityscape, Interlude, 1991, reached $55,000. Browse the catalogue for complete results.The next auction of African-American Fine Art at Swann Galleries will be held in Spring 2018. For more information or consign quality materials, contact Nigel Freeman at nfreeman@swanngalleries.com.